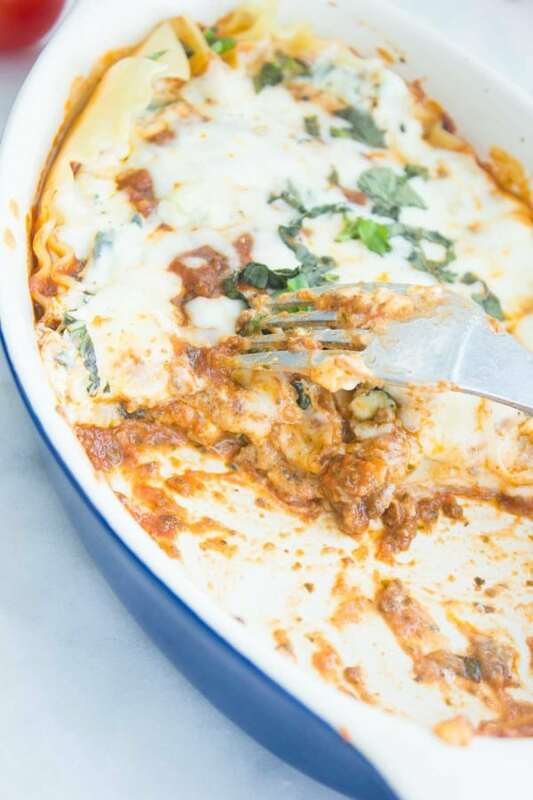 This is a really easy speedy blue cheese lasagna recipe—it comes together in a flash compared to a classic lasagna, it tastes much lighter and fresher, it’s loaded with flavors and it’s very versatile. 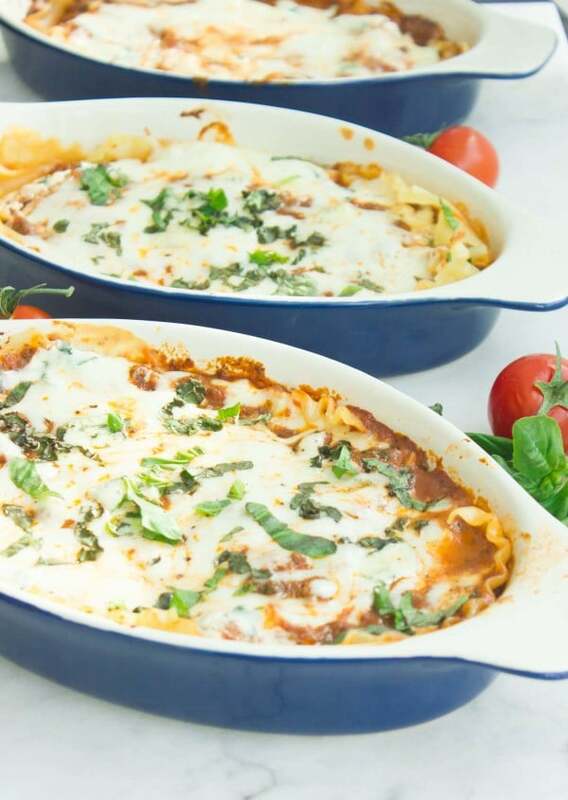 A speedy marinara sauce with beef and a no cook instant creamy white basil sauce are layered in between sheets of no cook lasagna pasta, all dressed up in blue cheese and fresh herbs for the ultimate lasagna night! I have a soft spot for lasagnas. 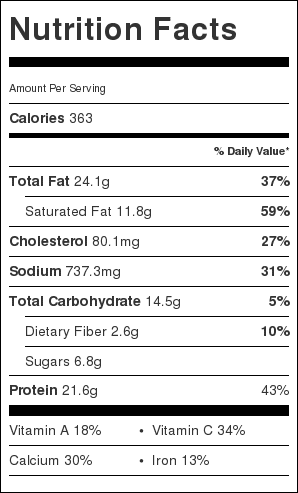 I probably ate the most of it during my college years, at that time it was like a treat. For some reason, lasagna to me now feels more like comfort food, not really a treat. 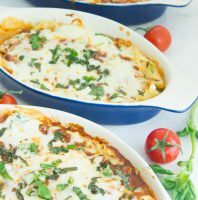 And this easy speedy blue cheese lasagna in particular is made so simple that it makes lasagna a go to option for convenience. 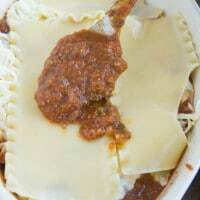 I have a dear friend who was always stuck with the ready made lasagnas thinking a homemade version is mission impossible with her busy schedule and three little kids. One of those days I told her I’m passing by for coffee, and I got all the lasagna ingredients with me to surprise her. I convinced her to stand next to me for just 30 minutes and if I took longer, she was free to go. She stuck there, watched, helped, tasted and at the end enjoyed, really enjoyed a fabulous homemade lasagna with a speedy twist and a load of goodness! 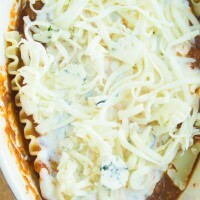 The blue cheese I add here is my personal preference—I feel it pairs beautifully with the beef and adds a unique taste. I think goat cheese would be wonderful here too and brie, and of course, the classic good old mozzarella is always a comfort favorite. 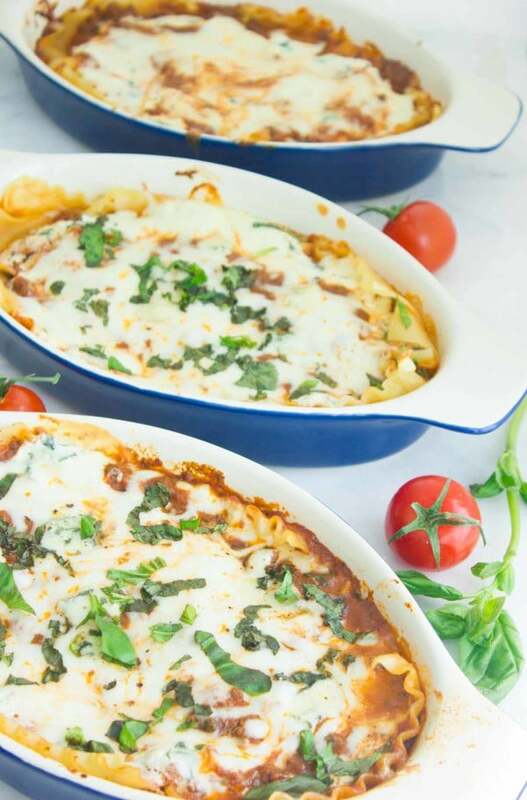 To get things easy and tasty for me, I love using any left over of this speedy lamb ragu pasta (replacing the lamb with beef), and if I don’t have any, I go to my quick homemade marinara sauce for the rescue! 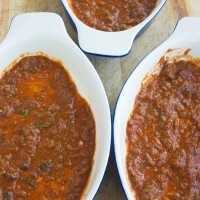 It’s quick, flavorful and makes a perfect tomato sauce when added to the sautéed beef. 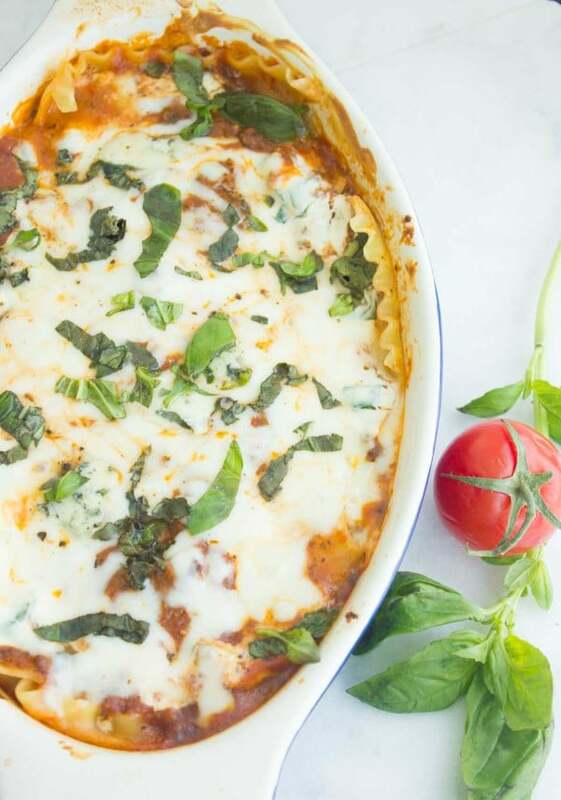 Now onto the instant creamy white sauce in this easy speedy blue cheese lasagna, it’s made by simply mixing up ricotta cheese, fresh basil (or basil pesto), parmesan cheese, seasoning, and thinning it out with milk (or cream for a creamier version) till the desired consistency. And it’s all done and ready for assembly. 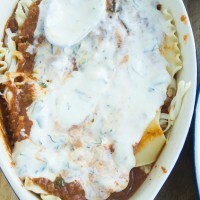 I buy any lasagna I find at the store—no fuss about it being no cook or boil pasta. Either way I soak the lasagna in a wide dish with some boiling water for 2 minutes just to make them softer and malleable. That way I cut them easier and fit them into my cute mini individual lasagna dishes and they need less time in the oven. heat up a deep skillet on medium high heat and add in the olive il, onions, sweet peppers and a pinch of salt. Sauté for 3 minutes until they are softened. Add in the garlic and oregano and sauté for a minute more. Add the beef, season it with salt and pepper and oregano. Keep sautéing the beef for 3 minutes until it’s fully cooked and no more pink color appears. 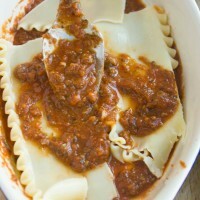 Add in the marinara sauce (if using) or the canned crushed tomatoes and season it with a pinch of salt. When the mixture comes to a boil, lower the heat to medium and let it simmer for 5 minutes, then add in the basil (or pesto, if using) and turn off the heat. Taste and adjust seasoning and add the red pepper flakes if desired. To make the white sauce, in a bowl, mix the ricotta, salt, pepper, parmesan, basil (or pesto) and add in the milk gradually while whisking until you reach the desired consistency. 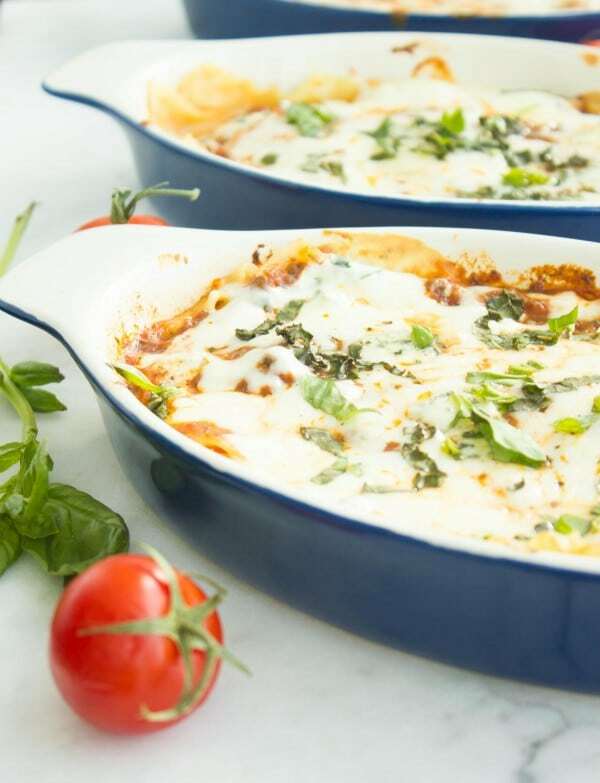 To assemble the lasagna, place a 1/4 cup of the tomato sauce at the bottom of your lasagna pan, and 2 tablespoons of white sauce on top. 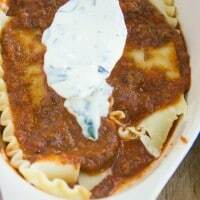 Then layer a sheet of lasagna, more red sauce, white sauce and a sprinkle of mozzarella cheese, a few crumbles of blue cheese, more lasagna sheets, and so on. 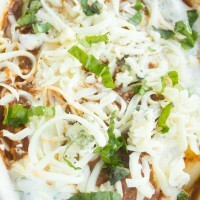 The top layer should always be a sauce layer (either tomato and white or just tomato) and then a sprinkle of cheese. Bake the lasagnas covered with foil for 15 minutes and then uncover and bake for 5 more minutes until the cheese is bubbly and golden. 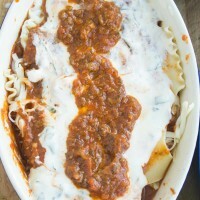 For a large lasagna pan, the process is the same, baking time goes up to 30 minutes covered and 5 minutes uncovered. Freeze right away after assembly and bake directly from the freezer for 10 minutes longer.